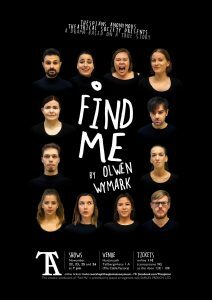 English-speaking amateur theater Thespians Anonymous proudly presents its new production “Find Me” by Olwen Wymark. Based on a true story, “Find Me” tells about Verity, a young girl with a mental disorder. The play depicts various moments of her life until she reaches the age of twenty when she is charged by the police for damaging a chair by fire in a mental hospital and brought to Broadmoor, a high-security institution. It uses a technique of multiple characterization to display the complex personalities of Verity and the ones surrounding her. Suitable for 13 years and above. Tanssiteatteri Hurjaruuth (Kaapelitehdas, Tallberginkatu 1A), Helsinki. Or buy AT THE DOOR (cash only; 12€ normal price/10€ concession). Group discounts (8€ per ticket) are available for 10 tickets or more. Just add 10 tickets or more to your basket on HOLVI and insert discount code FINDUS. You will get the discount automatically!